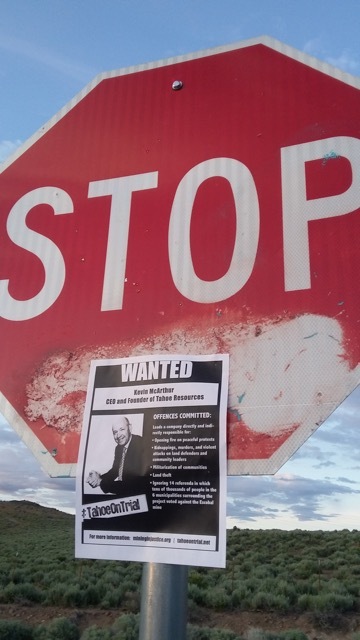 Toronto, Canada: Over four hundred ‘wanted’ posters affixed to walls, posts, and newspaper boxes greeted Tahoe Resources shareholders on their way into the mining company’s 2016 shareholder meeting this morning. The posters highlight charges against various Tahoe employees, ranging from ordering the shooting of residents to industrial contamination, as well as human rights and environmental abuses alleged by communities surrounding Tahoe’s flagship mine in Guatemala. Identical posters were also plastered across downtown Vancouver and Reno, the locations of Tahoe Resources’ Canadian and American headquarters. 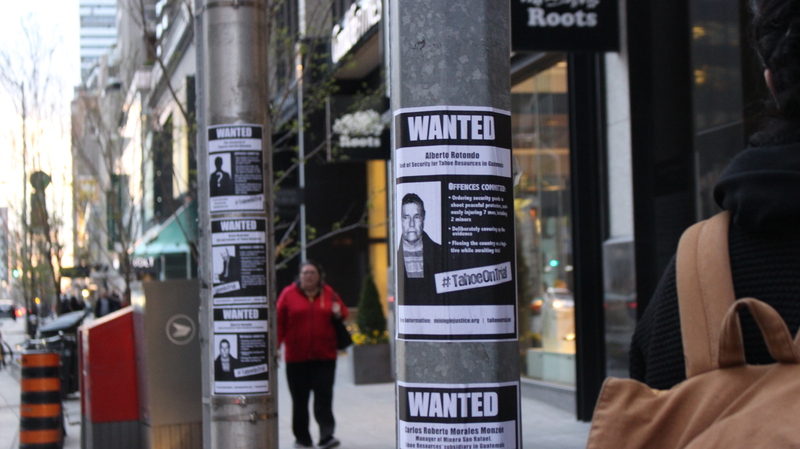 Above: Hundreds of posters covered the streets surrounding the Toronto Four Seasons where Tahoe Resources’ AGM was held this morning. “We wanted to make sure that the executives and shareholders entering Tahoe Resources’ annual general meeting were forced to confront their company’s crimes and the violence that communities around Tahoe’s Guatemalan mine have been subjected to in the name of their corporate profits,” says Rachel Small, a member of the Mining Injustice Solidarity Network (MISN), a Toronto based group. On April 27th, 2013, Tahoe Resources’ private security opened fire on peaceful protesters outside the Escobal silver mine, in the municipality of San Rafael las Flores in southeastern Guatemala.The seven victims, allegedly shot at close range while attempting to flee, filed a lawsuit in June 2014 in Canadian courts against Tahoe for its role in the violence. The company requested that the court decline jurisdiction, arguing that paying for translators and the international shipment of evidence would be too costly and ‘inconvenient’. B.C. Supreme Court Justice Laura Gerow agreed and stayed the lawsuit in November 2015, encouraging the plaintiffs to instead file in Guatemala, despite well-documented evidence of corruption, and widespread impunity for violent offenses in Guatemalan courts. This judgment is currently being appealed. Alberto Rotondo, former military officer from Peru and security manager for Tahoe at the time of the shooting, escaped police custody by fleeing house arrest in late 2015 while awaiting trial in Guatemala for allegedly ordering security to open fire on protesters and then covering up the evidence. After approximately one month as an international fugitive from justice, Rotondo was detained in January by INTERPOL in Peru and is currently awaiting extradition back to Guatemala. These lawsuits in Guatemala and Canada are only a small part of the bigger controversy surrounding Tahoe Resources’ Guatemalan mine. Since Tahoe Resources arrived in the region, Guatemalan community leaders opposing the mine have faced repression, criminalization and violence. Despite the conflict — or perhaps because of it — Tahoe rushed to put the mine into operation before establishing reliable mineral reserves, reaching commercial production in January 2014. Through 14 community-led consultations in six jurisdictions, over 50,000 people have voted against Tahoe’s mine and its expansion in the area. Below: Posters mounted in Reno, Nevada, near Tahoe’s US headquarters. 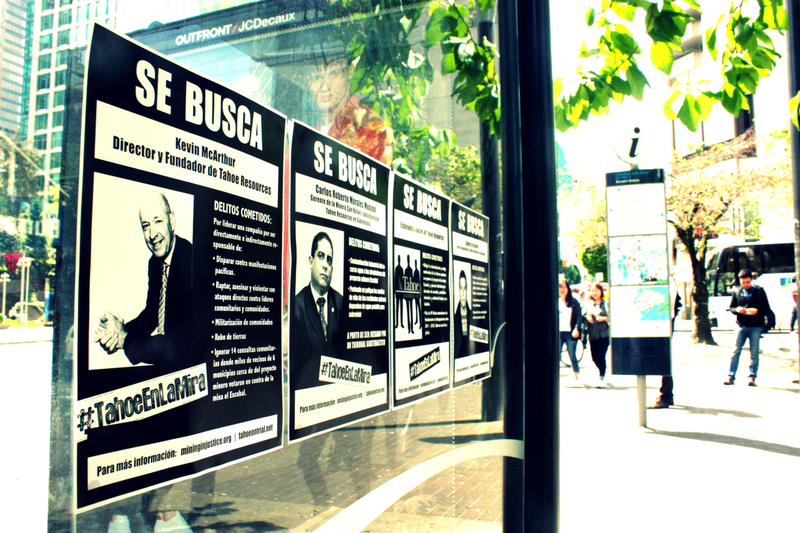 The ‘wanted’ posters describe human rights and environmental abuses linked to this company including murder, criminalization of land defenders, and industrial water contamination. In addition to Kevin McArthur, Tahoe’s founder and CEO, and Alberto Rotondo, the posters feature Carlos Roberto Morales Monzón, facing trial for water contamination endangering the lives of residents near the Escobal mine; the unknown assailants who killed 16 year old youth leader Topacio Reynoso and severely injured her father; and Tahoe employees and associates for targeted criminalization and stigmatization of community leaders opposing the Escobal mine. Out of 90 baseless accusations filed against mining impacted community members between 2011-2015, only one case ever went to trial. The Mining Injustice Solidarity Network (MISN) is a Toronto-based volunteer group that works closely with communities impacted by Canadian extractive industries globally in order to support their self-determination, educate the Canadian public, and bring companies to justice. Media contact: Rachel Small, Mining Injustice Solidarity Network, 647-769-2472,mininginjustice@gmail.com. (Guatemala City/Ottawa/Tatamagouche) On Monday, plaintiffs in the criminal case against Tahoe Resources’ former security manager, Alberto Rotondo, were informed that he had escaped police custody. Rotondo is accused of having ordered private security guards to attack peaceful protestors outside the Escobal mine in southeastern Guatemala on April 27, 2013, wounding seven men. “This demonstrates that the Guatemalan justice system, especially the National Civil Police, still suffers from high levels of corruption and influence peddling. The police failed to implement the judge’s order to ensure constant police supervision of Rotondo, now turned fugitive,” remarked Rafael Maldonado, Director of the Center for Environmental, Social and Legal Action (CALAS). Rotondo, an ex-military officer from Peru, was arrested on April 30, 2013 at Guatemala’s international airport while attempting to flee the country, but was granted house arrest. He was indicted on charges of causing serious and minor bodily harm to four of the seven men injured in the attack, as well as for obstruction of justice; crimes that could lead to up to 28 years in prison. The trial is set to begin January 20, 2016. During the last two and a half years, the Public Prosecutor has twice appealed the decision to grant Rotondo house arrest, finally winning the appeal in October 2015. The decision was in process late last week when the judge requested to see Rotondo and found him missing. This was reported to CALAS on Monday. “Rotondo’s escape puts justice further out of reach for these seven men, coming as it does on the heels of the British Columbia Supreme Court’s decision to decline jurisdiction over a civil lawsuit that these same men filed against Tahoe Resources for its role in the April 2013 violence,” comments Jen Moore for MiningWatch Canada. B.C. Supreme Court Justice Laura Gerow ruled that the case against Tahoe Resources should be heard in Guatemala, saying it would be inconvenient to hear the case in Canada. “Justice Gerow ignored the fact that Tahoe Resources’ management has failed to show up to court in Guatemala when summoned for another legal case, just one indication of the tremendous power imbalances these men are up against in trying to sue a transnational corporation,” states Jackie McVicar for the Maritimes-Guatemala Breaking the Silence Network. Since receiving its exploration license in 2011 without the consent of the local community, Tahoe Resources’ Escobal mine has been mired in conflict, and subsequent judicial proceedings. Over 50,000 people have voted against the mine’s operations and its expansion in the area. In response to peaceful protest, the company and the Guatemalan government have used repression, criminalization, and militarization to try to silence peaceful resistance to mining activities in the area, including the violent attack in April 2013, for which Rotondo is accused. (Ottawa/Toronto/Montreal) Canadian mining company Tahoe Resources and the Guatemalan government have used repression, criminalization and militarization to try to silence resistance to the company’s Escobal mine project, according to a forthcoming report from Guatemalan investigative journalist Luis Solano. Solano will be in Canada from November 9 to 13, to present his findings about the militarization of communities in the area of the Escobal mine project, located in southeastern Guatemala. Events will be taking place in Ottawa, Toronto and Montreal. For five years, communities affected by Tahoe Resources’ Escobal mine have been peacefully defending their lands and livelihoods. Multiple plebiscites have been organized in which more than 55,000 people in seven municipalities have voted against the silver mine and proposed expansion plans. Despite their clear message, the company and the Guatemalan government, with tacit support from the Canadian Embassy, have continued to impose the project. “The company has employed US and Latin American security contractors to design a militarized security strategy oriented to keep down local opposition to its mine,” remarks Luis Solano. The result has been persistent violence and conflict, including one incident for which Tahoe Resources is now being sued in the Supreme Court of British Columbia. Norway’s Council on Ethics cited the risk of further human rights violations earlier this year when it recommended against investment in Tahoe Resources. Luis Solano is author of the book ‘Oil, Mining and Power in Guatemala’, as well as an economist and political analyst. He works as an investigative journalist writing for diverse media outlets and organizations, such as Inforpress Centroamericana, El Observador and Plaza Pública. MiningWatch Canada and the International Platform against Impunity commissioned his forthcoming report on the militarization of communities around Tahoe Resources’ Escobal project. He will travel to Geneva to present the report following his visit to Canada. Solano’s findings are illustrative of a broader trend of the intensifying criminalization of mining-affected communities and their allies in connection with Canadian interests in Guatemala and the Americas, as documented by MiningWatch Canada, the International Civil Liberties Monitoring Group (ICLMG) and Voices-Voix. Between November 9 and 13, Luis Solano will travel to Ottawa, Toronto and Montreal for public events and meetings. He will be available to speak with media. Tour Supporters: Amnesty International Canada, Canadian Network for Corporate Accountability, Comité pour les droits humains en Amérique latine (CDHAL), Education In Action, KAIROS: Canadian Ecumenical Justice Initiatives, L’Entraide Missionaire, Maritimes-Guatemala Breaking the Silence Network, McGill Research Group Investigating Canadian Mining in Latin America (MICLA), Mining Injustice Solidarity Network, MiningWatch Canada, Projet Accompagnement Québec Guatemala (PAQG), the Public Service Alliance of Canada Social Justice Fund, Coalition québécoise sur les impacts socio-envionnementaux des transationales en Amérique latine (QUISETAL), Territorio Libre, and Voices-Voix. (Guatemala/Ottawa/Washington/Tatamagouche) Forty-eight international organizations are calling for an investigation into the second armed attack in as many years against a well-known activist who is part of the peaceful resistance to Tahoe Resources’ Escobal silver mine in southeastern Guatemala. On Saturday, October 17, Alex Reynoso – a human rights and environmental activist – was shot by unknown assailants while traveling with five others in Mataquescuintla, Jalapa, Guatemala. Two other men, Marlon Loy Dominguez and Estuardo Bran Clavel, were also injured in the attack. Reynoso was first shot and injured in April 2014 in an assault that killed his 16-year old daughter, Topacio, a well-known youth activist. Both Alex and Topacio were active in the peaceful resistance against US-Canadian company Tahoe Resources, which announced commercial production at its controversial silver mine in 2014. Alex is currently in stable condition, recuperating from a gunshot wound in his lower back. There has been constant opposition to the Tahoe Resources project since it was proposed in this largely agricultural area. Before the mine went into operation, tens of thousands of people in the area had voted in community and municipal plebiscites against any mining. In Mataquescuintla alone, in 2012, over 23,000 people participated in a local plebiscite, and 98.3% voted against mining. Reynoso played a key role in organizing the vote. During Guatemala’s elections in September 2015, local mayors, including the two-term mayor from Mataquescuintla, and councilors won running on anti-mining platforms. “The attack wasn’t only against me, but also the local community development councils. We were at a meeting with the mayor to hear about the latest steps in the consultation process over mining and to thank the community for their work during the elections. On our way back home, the gunmen opened fire,” said Reynoso from the hospital. Despite widespread public opposition to the project, however, Tahoe Resources maintains that it has had “great success” in educating local residents about the benefits of the project. In 2013, private security guards shot seven men who were part of a peaceful protest outside the mine site. The former head of security for the company was charged in connection with the shooting after wire-tap evidence indicated that he targeted peaceful protesters, then tried to cover up the crime and flee the country. In June 2014, the seven men filed a civil suit against Tahoe Resources in the British Columbia Supreme Court for negligence and battery in connection with the violence. The letter sent from international organizations to Guatemala’s Attorney General calls for a full and impartial investigation, and for protection for Reynoso and others whose lives are at risk for defending their land, water and peace in their communities. The international organizations also called on Canadian and US Embassies in Guatemala to be attentive to the situation as it develops. They concluded by expressing their solidarity with the affected communities. Click here to add your name to the call for a full and impartial investigation. Click here to read the full letter in English. Click here to read the full letter in Spanish. (Guatemala City/Ottawa) Monday, a Guatemalan judge denied bail to the Administrative Manager and Legal Representative, Carlos Roberto Morales Monzón, of Tahoe Resources’ subsidiary, Minera San Rafael S.A., and ordered him to pre-trial detention on charges of industrial contamination. The Guatemala’s Public Prosecutors’ Office for Crimes Against the Environment launched an investigation in 2012 into the company’s contamination of water sources near its Escobal silver mine. The trial date is set for June 12. Tuesday, Tahoe Resources issued a press release downplaying the decision and Carlos Roberto Morales Monzón’s role in the company, referring to him as an “employee”, not the “mine manager”. Nonetheless, a February 2013 Constitutional Court decision refers to Mr. Morales Monzón as the Administrative Manager and Legal Representative for Minera San Rafael. The company also said it will appeal Monday’s decision. “This is remarkable. Tahoe Resources now has two managers from the Escobal mine in pre-trial detention, beginning two years ago with the company’s former security manager who was detained on charges of assault and obstruction of justice. It will be even more remarkable if these cases continue to proceed,” stated Ellen Moore for the Network in Solidarity with the People of Guatemala. The criminal case, which carries a sentence of up to eight years in prison if convicted, is the result of a complaint that the Center for Social Legal Action in Guatemala (CALAS) filed for contamination of the Escobal Creek and the El Dorado River, located near the community of Los Planes, just steps from Tahoe’s project. The alleged contamination occurred while the project was still in the exploration phase. The Guatemalan Ministry of Health confirmed that a discharge of water from the mine installations was contaminated with suspended solids. Around this same time, local residents were reporting that contamination was affecting water used for crop irrigation. Since then, community members have been denouncing increasing scarcity of water in the area immediately surrounding the project, similarly believed to be a result of Tahoe’s mine. This latter concern is not part of the legal process. “With several legal processes underway against the company and its affiliates, along with ongoing community resistance to the mine and its expansion plans, it should be ever more clear to investors that this company is a dangerous investment,” commented Jen Moore for MiningWatch Canada. The extent of local concern over negative environmental and social impacts, present and future, of the mine on water supplies and community wellbeing has generated widespread community opposition to the project. As of March 2013, tens of thousands had voted against the project in local plebiscites and residents had filed more than 250 specific complaints against the granting of Tahoe’s final permitting license. The Ministry of Mines and Energy dismissed the complaints without consideration immediately before granting the company a license in April 2013. A lawsuit is pending in Guatemala’s Constitutional Court for lack of due process in this regard, which has raised questions about the legality of Tahoe’s exploitation license. Protests that emerged in the wake of the Ministry’s hasty decision to grant Tahoe’s final permit faced police repression and an armed attack by company security guards on April 27, 2013 that left seven men injured. This latter event is the subject of a criminal case in Guatemalan courts against Alberto Rotondo, former security manager for Tahoe Resources, accused of having ordered and then attempted to cover up the attack. The seven men have also brought a civil suit against Tahoe Resources in British Columbia for negligence and battery in connection with the shooting. In January 2015, the Norwegian Ethical Fund recommended against investing in Tahoe Resources, citing “unacceptable risk of the company contributing to serious human rights violations through its operation” at the Escobal silver mine in southeastern Guatemala. For more information about this situation, follow tahoeontrial.net. (Ottawa/Guatemala) North American shareholders in Tahoe Resources should follow the Norway’s Council on Ethics’s lead and divest say Canadian and U.S. organizations. They urge Canadian and U.S. investors to make use of a report published last week that recommends the exclusion of Tahoe Resources from the from the Government Pension Fund Global (GPFG) portfolio due to “unacceptable risk of the company contributing to serious human rights violations through its operation” at the Escobal silver mine in southeastern Guatemala. After considerable investigation, including communications with Tahoe Resources and information gathered from diverse sources such as the UN High Commissioner for Human Rights in Guatemala, the Norwegian Council determined that the project poses a high level of risk given insufficient consultation processes, considerable resistance to the mine, inadequate measures to avoid human and Indigenous rights abuses and militarization of the area. “With this report in hand, it should be a no brainer for U.S. and Canadian investors to drop their shares in this company whose operations represent a tremendous risk to the lives and wellbeing of thousands of residents in communities in San Rafael Las Flores and area,” remarks Jen Moore Latin America Program Coordinator at MiningWatch Canada. The Council did not believe Tahoe’s claims that the apparent calm around the Escobal mine is a sign of support for the mine. The report reads: “…the company’s statement that the situation in and around SRLF is now more peaceful than in the months preceding the state of emergency [in May 2013] is probably correct. As the Council understands it, this is due to the militarization occasioned by the conflict.” The Council attributes militarization with breaking up organized resistance and a temporary stoppage of local consultation processes. “Even before the military state of siege was imposed on municipalities, military presence and repressive tactics were ramped up, in part due to a so-called ‘development’ office in San Rafael Las Flores with backing from Tahoe and oversight from a military colonel. It is encouraging that the Norwegian Council on Ethics recognizes that what has been growing in the area is fear, not support for this project,” comments Ellen Moore from the Network for Solidarity with the People of Guatemala (NISGUA). Before the state of siege, communities in the area held fourteen referenda, in which tens of thousands of people in the six municipalities closest to the project voted against the Escobal mine given their concerns over current and potential environmental and social impacts. A pilot project in San Rafael Las Flores overseen by the National Security Commission and referred to as the “Inter-institutional Group on Mining Affairs” was initiated in March 2013. As well, since the siege, a permanent military presence has been established in the area. The Council also found that Tahoe failed to take adequate steps to prevent further abuses after private security guards shot at peaceful protesters outside the mine gate on April 27, 2013. Two separate lawsuits against Tahoe’s then head of security and the company in connection with this incident are ongoing in Guatemala and Canada respectively. Overall, the Council finds that Tahoe’s policies and training standards are not enough to guarantee that the company will not continue contributing to human rights violations. The Canadian Pension Plan most recently reported that as of March 31, 2014 it holds $49 million CAD worth of shares in Tahoe Resources. As of 2013, U.S. based TIAA-CREF, considered to be a socially responsible financial services company specializing in the needs of the non-profit and education sector, held some $5 million USD worth of shares. Online letters can be sent calling on the CPPIB to divest here and to the TIAA-CREF here. 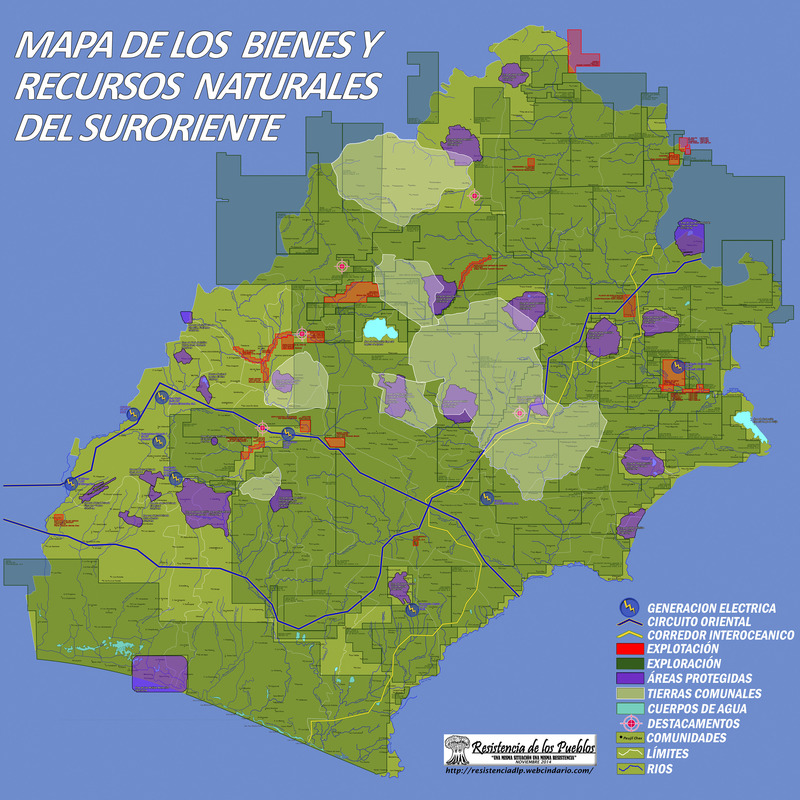 A new map illustrates the relationship between company holdings and affected communities. See a backgrounder on Tahoe Resources for more information. (Guatemala City/Ottawa) On Wednesday, a Guatemalan judge decided that Tahoe’s former security manager, Alberto Rotondo, should stand trial for his role in a shooting attack on peaceful protesters in April of last year. Vancouver, June 18, 2014. Seven Guatemalan men filed a civil lawsuit today in a Vancouver court against Canadian mining company Tahoe Resources Inc. for injuries they suffered last year when Tahoe’s security personnel opened fire on them at close range. The men, residents of San Rafael Las Flores, where the company’s Escobal mine is located, allege that Tahoe is legally responsible for the violence inflicted on them as they peacefully protested against the mine.